Today, the savviest executives are realizing the power and potential of communication to drive results. Smart leaders know they need to connect the dots differently than before. This eBook will help communication professionals recognize the 10 most common barriers to effective communication that leaders construct. It reveals what communicators can say to their leaders to help guide their thinking and offers a host of actionable tips for moving leaders past these barriers, including what to say and what to do. 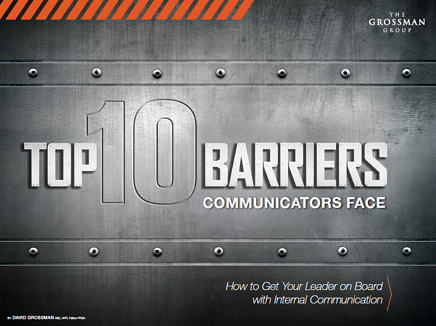 Download the Top 10 Barriers Communicators face and get the tools you need to break down the barriers when working with your leaders.